Google announced today at CES some new features for its virtual personal helper, Google Assistant. For example, those with Assistant on their Android or iOS device can use it in conjunction with Google Maps to make driving safer. Maps users will now be able to use Google Assistant and their voice to respond to text messages, stream music or podcasts, and tell friends and family their ETA. Users will also be able to search for places that they pass along their journey, and add a new stop. With this new Google Maps integration, drivers can rely on Google Assistant so that they won't have to take their hands off of the steering wheel, or take their eyes off the road to do these things. On Android, Google Assistant works with messaging systems like SMS, WhatsApp, Messenger, Hangouts, Viber, Telegram, Android Messages and more. To open Google Maps while driving, just say "Hey Google, take me home." Another new feature on Google Assistant will allow Android and iOS users to check in to their flight by simply saying, "Hey Google, check in to my flight." This will first be offered for domestic (U.S.) flights by United Airlines. 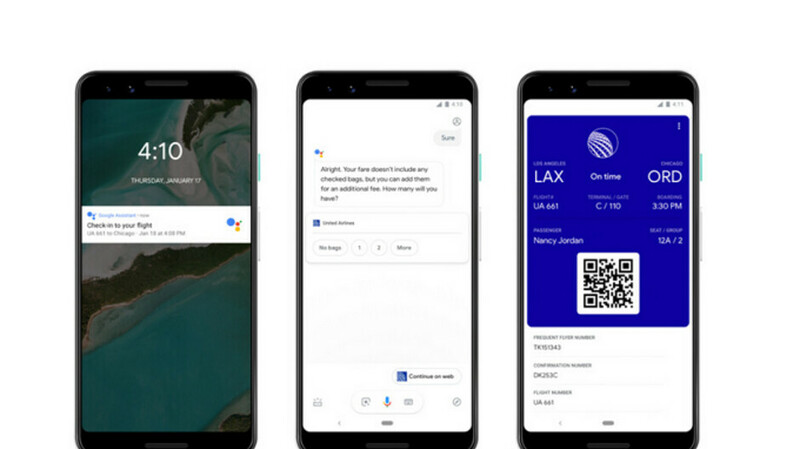 Travelers will be able to save and retrieve their boarding pass using their phone, and Google Assistant will send out a notification when the plane is ready for boarding (see images at the top of this article). When it comes time to book a room, Google Assistant can handle that task too, thanks to its partnerships with Choice Hotels, AccorHotels, InterContinental Hotels Group, Priceline, Expedia, Mirai and Travelclick. Google Assistant will also keep track of a traveler's itinerary through apps like Google Keep, Any.do, Bring! and Todoist. Google is also adding a feature that will allow Android users to access Assistant even with their phone locked. Those wanting to take advantage of this will have to opt-in from the settings menu. While this is only available on Pixel phones for now, other Android devices will get this feature over the next few weeks. And coming to Google Home smart speakers and smart displays will be a new Interpreter Mode. For example, say "Hey Google, be my French interpreter" to get real time spoken and written (on smart displays, of course) translations from Google Assistant. Is it just me, or do people have trouble starting the navigation when using voice to command google assistant? I say "directions to home" and it will just bring up a google maps preview with estimate and directions but doesn't start the navigation. am I doing something wrong? Once you've confirmed it's what you want in terms of destination, tell it to start navigation. I say "Navigate Home" and it starts the maps with navigation and not just directions. Just say "Hey Google, take me Home." Works like a charm, every time.